Millions of Indians on Wednesday mourned the demise of Pakistan-based ghazal maestro Mehdi Hassan, one of the greatest ghazal singers ever whose silken voice has charmed generations. 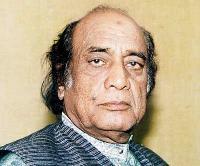 Mehdi Hassan, who was born in 1927 in Juhunjhunu (Rajasthan) in undivided India, died in a private hospital in Karachi on June 13, 2012. Prime Minister of India Dr Manmohan Singh was amongst the first of the leaders to express condolence over the legendary ghazal exponent's death. Singh conveyed his intense grief over the passing away of the man who was equally loved in India, as he was in Pakistan. Lata Mangeshkar, India's melody queen, said that there was never and there will never be a voice as beautiful as Mehdi Hassan. The 85-year-old was suffering from ailments of the lung. Mehdi Hassan is credited with popularising Urdu poetry, especially ghazal, by his unique style of rendition. Even people who didn't understand Urdu got addicted to listening ghazals due to his charming voice. Indian media, newspapers and singers said that the golden era of ghazals has come to an end with his demise. Lata Mangeshkar had once termed his voice as divine. Former Prime Minister Atal Bihari Vajpayee was amongst his fans. Either it was Ghalib, Mir Taqi Mir, Zafar or Faiz, he sang ghazals in such beautiful voice, that their poetry, through Hindustani classical music, acquired even more fame and spread across the world. After Jagjit Singh's death, music lovers were praying for Hasan's health as he was hospitalised for long.